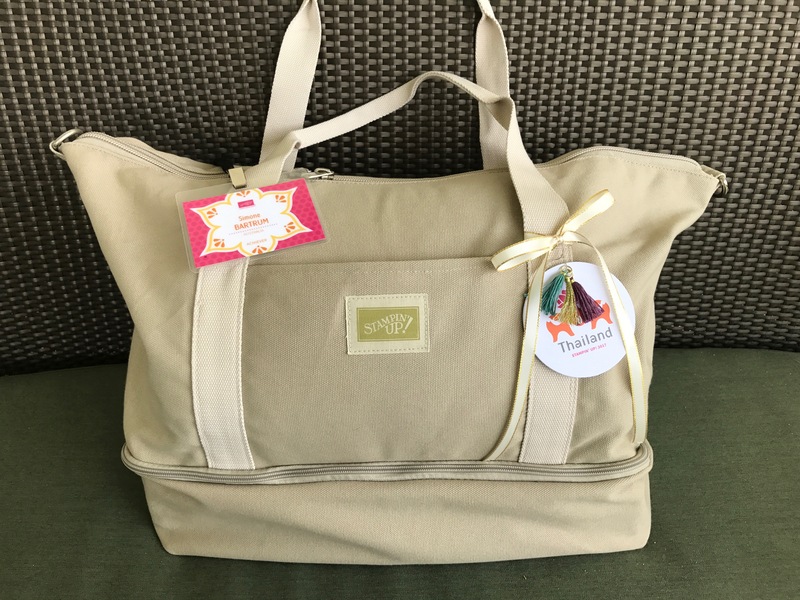 One of the perks of going on the Thailand Incentive Trip with Stampin’ Up! is that we have permission to share some sneak peeks of new catalogue products with you. We were so spoilt with many, many products from the upcoming Holiday Catalogue. Do you remember that gorgeous bag I showed you on the trip highlights post? The one we got as a pillow gift? Well, look what I’ve been storing inside it…. Squeeal!!!! Stampin’ Up! are sooooo generous. However, I do have a fun project to share with you today. In fact it’s one from the presentation I did at the Share Fair in Thailand. This was a card I had on display, and it’s a mix of old and new products. The window frame may look familiar – it’s from the Hearth & Home Thinlits Dies. And trust me, if you don’t already have those dies, you’ll definitely want to order them now! And you may recognise the Brick Wall embossing folder. Can you notice any new products in there? This card is a modified version of the ‘double front card’ layout, with a couple of flip-up layers. And this layer lifts up too, to reveal another layer…. I’m loving those pine boughs too. Do you want to know something really cool? Six of those pine boughs fit perfectly over the stamped image of the Christmas tree. As in, they are an EXACT match! Three on the bottom, two in the middle row, and one pointing straight up for the point of the tree. No need to fuss around trying to get the branches into a lovely tree shape. Just stamp the tree image, then stick the boughs over the top. Coordination at its finest, and oh so clever. This is the fabulous 20 piece Ready For Christmas stamp set and 20 piece Christmas Staircase thinlits, and it was my absolute joy to create with it in the weeks leading up to the Thailand Incentive Trip. I have loads more projects, hints & tips to share with you over the weeks and months ahead, especially to do with the staircase part of this set. So make sure you don’t miss out on any of it! The best way? Follow me on Facebook or subscribe to my blog posts. There’s a spot over in the sidebar of my blog where you can sign up for email notifications of new posts. Click HERE to download instructions for this card. If you would like to get your hands on Christmas products EARLY then now is the perfect time to get the starter kit and join my beautiful team of crafters. Ooooh thank you so much Rochelle! I really appreciate your lovely comment. It’s such a fun card to open, but not hard at all to make! Gotta love that. Oh my goodness, Simone, this is beyond brilliant. Clever, imaginative & adorable all in one. It really made me smile too. Thanks so much for sharing it. I really love this set and love the versatility. So many pieces to play with! WOW! I love that double layer card front and you did it spectacularly!! Definitely going to use that idea for my stamp club – so clever and new! Gorgeous!! Beautiful stunning card. I spent over two hours on-line trying to find a similar card with a tutorial. However the only results that I achieved were double-vision and frustration, Many thanks for share with everyone. Thank you so much for the tip about the tree and the 6 pine boughs! I was trying to figure those out! Love your cards,too!